HEEL PAIN "IT IS NOT ALWAYS A SPUR"
By: Robert H.Sheinberg,D.P.M., D.A.B.F.A.S., F.A.C.F.A.S. Heel pain is the most common reason why people visit our office. Most people think a spur is the cause of their pain. While this is true in a minority of cases, many other causes may be present. If the proper diagnosis is not made, treatment will be delayed with a potential for prolonged pain and in some cases severe consequences. DID YOU FEEL A POP OR SUFFER A TRAUMATIC INJURY? With any history of known trauma or persistent pain from initial incident, an X-ray, Ultrasound and/or MRI may be necessary to rule out a fracture of the calcaneus bone or rupture of the plantar fascia before other causes would be evaluated for and treated. Once ruled out the following pathologies listed below are explored as potential causes of the heel pain. Treatment for acure rupture of the plantar fascia inludes: rest, ice, compression, elevation, short period of non weightbearing until the pain is tolerable in a protected weightbearing CAM walker or cast; the ligament can take up to 12 weeks, sometimes more if reinjury occurs, to completely heal and return the patient to normal function. "PLANTAR FASCIITIS" Pain to the bottom of the heel or in the arch is caused by inflammation of the ligament (plantar fascia) that helps to support the foot. It is the most common condition causing heel pain. It may be caused by bad shoes, poor flexibility, alteration in one's activity routine, walking barefoot, poor biomechanics (flatfeet or high arch feet) or direct trauma. Pain is usually the worst after getting out of bed to walk in the morning or after standing from sitting for a short period of time. The pain will usually lessen or go away, but will reappear later in the day as the condition progresses. The heel and/or arch are usually tender without swelling. Treatment may include Rest, Ice, Taping the foot, Anti-inflammatories and Physical Therapy, Orthotics (custom insoles for shoes) and will usually permanently alleviate the problem. Occasionally Immobilization of the foot in a cast or brace to rest the foot may be needed. Surgery is almost never necessary and if so, noninvasive shockwave therapy is performed. A failure to improve following shockwave therapy may necessitate a small procedure to release the tight ligament from the heel bone and allow in most cases full recovery. "STRESS FRACTURES" An overuse injury where the heel bone (calcaneus) has too much stress on it causing it internally to break (microfracture). It is usually due to a sudden alteration in one's training regimen. The heel bone will be diffusely tender and mild to moderately swollen. The pain may be mild in the morning and will always worsen as the day goes on. Treatment includes Rest and occasionally a walking cast or boot to allow the bone to heal. If the foot posture predisposes the patient to these problems, a custom molded orthotic made for the shoe should prevent recurrence. "ACHILLES TENDINITIS" Inflammation to the Achilles tendon on or near its attachment to the back of the heel is very common. It is usually due to a sudden change in one's training regimen. It is also seen in people with tight calf muscles, poor biomechanics (flatfeet, high arched foot) and those who wear bad or worn shoes. There will always be pain in the back of the heel getting out of bed in the morning or after sitting for a prolonged period of time. As one walks, the pain and stiffness lessen. If untreated it may worsen to pain with some burning in the back of the heel throughout the day. Walking may become very difficult. The inflammation may weaken the tendon, causing it to rupture. Treatment may include Rest, Ice, Anti inflammatories, Heel Lifts, Orthotics and Physical Therapy to reduce the inflammation and improve flexibility and strength. Immobilization in a cast or boot may be indispensable, especially in patients who have difficulty walking on a daily basis. This may be necessary for 4-6 weeks. Excellent results have been achieved using this treatment approach. If conservative care fails surgery may be necessary to alleviate the problem. This can include removing scar tissue in and around the tendon. This will help to improve its function. "SEVER'S DISEASE" This is a common condition seen in children between the ages of eight and fourteen. The growth plate on the back of the heel becomes inflamed from the Achilles tendon and arch ligament pulling on it. The condition is usually seen during growth spurts. It may also be caused by poor shoe gear, tight calf muscles and flat or high arched feet. Pain is usually present during the later part of an activity and tenderness is directly present on the back and sides of the heel. Rarely is there swelling. Treatment may include Rest, Ice, Heel Lifts, Stretching the calf muscle, Physical Therapy and Anti-inflammatories. Orthotics for the shoes may provide immediate benefit and prevent recurrence. Occasionally a walking cast may be needed for children who have difficulty weightbearing or who become very chronic. This will almost always correct the problem permanently as the cast not only rests the heel but stretches the calf muscle. Casting may be necessary for 2-6 weeks. "BONE SPURS" Spurs may occur in the back or bottom of the heel. Spurs in the bottom of the heel never hurt. Spurs in the back of the heel are usually attached to the Achilles tendon and may cause significant discomfort. These spurs usually develop over months or years. Significant pain may be present when the spur on the back of the heel is touched or accidentally bumped. These conditions are always associated with Achilles tendinitis. The problem may occur from poor calf flexibility, poor biomechanics (flat or high arched feet), poor shoe gear or trauma. Treatment includes Rest, Ice and proper shoe gear, especially those with a small heel lift. Orthotics to correct any biomechanical problem as well as Physical Therapy and occasionally Anti-inflammatory pills may be needed. In some cases, Immobilization in a walking cast may be necessary to completely rest the area. If conservative treatment fails, surgery to remove the spur will eliminate the problem permanently. "FRACTURES" A break in the heel bone is usually preceded by falling directly on the heel from a height. Mild to severe pain, swelling and deformity may be present. In most cases there will be some difficulty walking. Treatment includes Cast and Crutches. If the fracture is displaced (bone is out of alignment) surgery may be necessary. X-rays and occasionally CT scans are needed to assess the degree of damage. Without proper care severe permanent damage may take place, causing a lifelong chronically painful foot and ankle. "NEURITIS (TARSAL TUNNEL SYNDROME)" Inflammation of the nerves or chronic nerve compression may cause pain, burning, numbness, tingling or shooting sensation on the inside of the ankle or heel. It may be caused by tight ligaments, tumors, flatfeet or trauma to the heel or ankle region. Night pain is common. There usually is increased pain and abnormal sensations with weightbearing. Percussing (gentle tapping) the area may cause shooting pain up and down the leg or foot. Treatment may include Rest, Orthotics, Physical Therapy or Anti-inflammatory pills or shots. Immobilization for 4-6 weeks in a boot or a cast may help to alleviate the pain. If unresponsive, MRis and nerve conduction studies are performed to evaluate the extent of nerve injury. Surgery may be necessary to alleviate the pain and restore normal mobility. Prognosis is usually excellent. "FAT PAD ATROPHY" The fat pad beneath the heel helps to absorb shock during walking or running. People who lose the shock absorbent capacity of the heel will complain of pain on the bottom of the heel with prolonged standing or walking. The condition may occur from trauma (heel fracture) or from aging. Treatment with Orthotics with Shock Absorbing Materials and Proper Shoe Gear is the best treatment. "INFECTIONS" Puncture wounds or cuts may allow bacteria to penetrate the skin or bone. Redness, swelling, heat and severe pain may be present. Infections may be accompanied by fever or chills. Immediate treatment is needed to clean the wound and prescribe antibiotics. It may be necessary to do this in an outpatient operating room. If not treated properly devastating complications may arise, including bone infections, requiring surgery. "GENERALIZED ARTHRITIS" Different types of arthritis (rheumatoid, psoriatic, Reiter Syndrome) may cause pain in the heel that may be indistinguishable from plantar fasciitis. Pain upon first weightbearing out of bed in the morning or after sitting for a short period of time is most common. The pain may not lessen as it does in plantar fasciitis. A thorough history and physical examination with x-rays is necessary. Blood tests may also be needed. Local and systemic treatments are necessary to treat and potentially eliminate the problem. "JOINT ARTHRITIS" Arthritis in the foot may cause pain in the heel area. The joint just above the heel (subtalar joint) may become affected from trauma to the foot or ankle region that had occurred years earlier. Pain is present with weightbearing after sitting for a prolonged period of time. The pain will lessen to some degree but pain will usually persist, causing difficulty walking. Limited movement of the foot from side to side will also be present. Pain and swelling on the outside of the foot is also seen. Treatment includes Rest, Ice, Anti-inflammatories, Physical Therapy, Orthotics and occasionally Injections into the joint. Surgery may be necessary to help treat the condition. 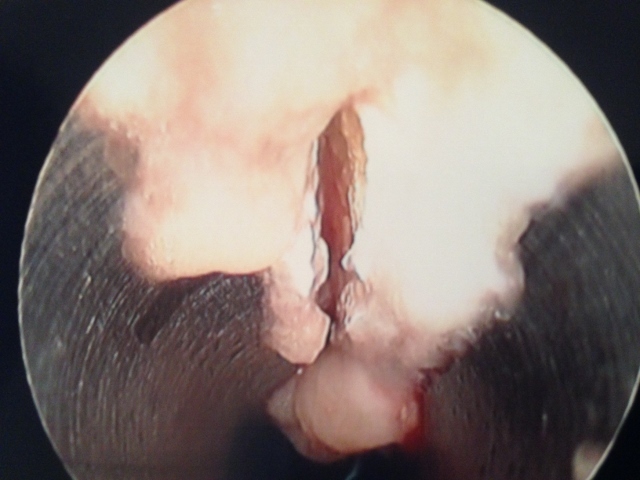 Cleaning out the joint arthroscopically will be helpful in mild conditions. In more advanced cases fusions are necessary to completely eliminate the problem and allow a return to daily activities. "TUMORS" Benign or malignant tumors of the soft tissue or bone are rare. Pain is the most common complaint. However, it is not uncommon for these conditions to be asymptomatic. Physical examination and radiographs (x-rays) are the first steps in diagnosis. CT scans and/or MRis may be needed. Definitive diagnosis may be achieved by means of a biopsy or excision. 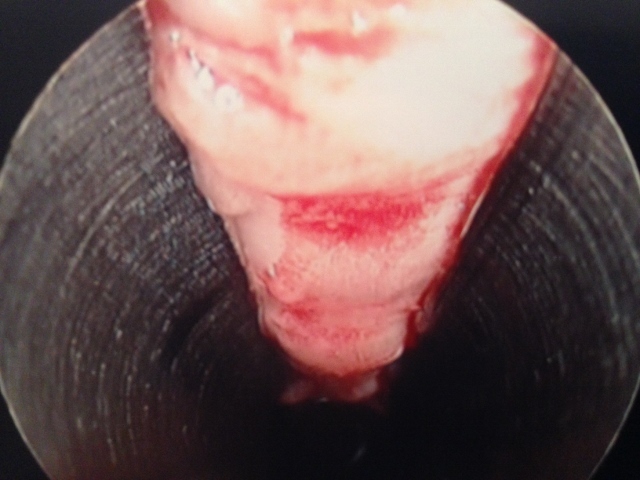 Pictures during an endoscopic plantar fasciotomy or release. The medial band of the fascia is visualized on the left. The two right pics are during the release of the band. More Intraop Pics of Endoscopic Plantar Fascia Release. The thickened fascia is seen on the left. 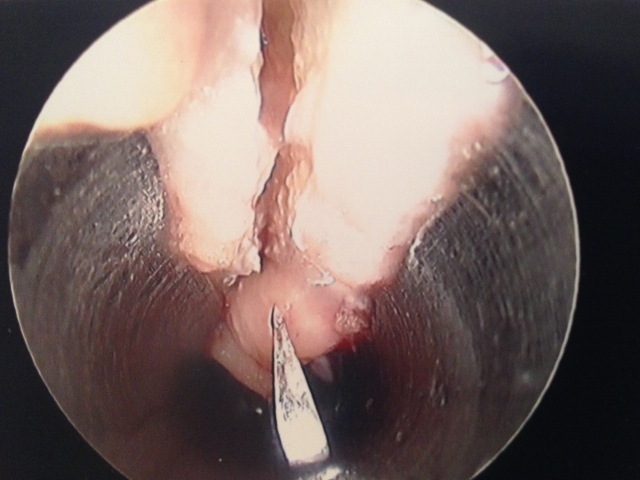 The Blade is cutting through the fascia in the center pic and confirmation of complete release of that portion of the ligament is noted as we can see the intrinsic muscles after release. Lateral X-ray with plantar calcaneal Heel Spur. MRI of Severe Plantar Fasciitis of the Medial and Central Band. 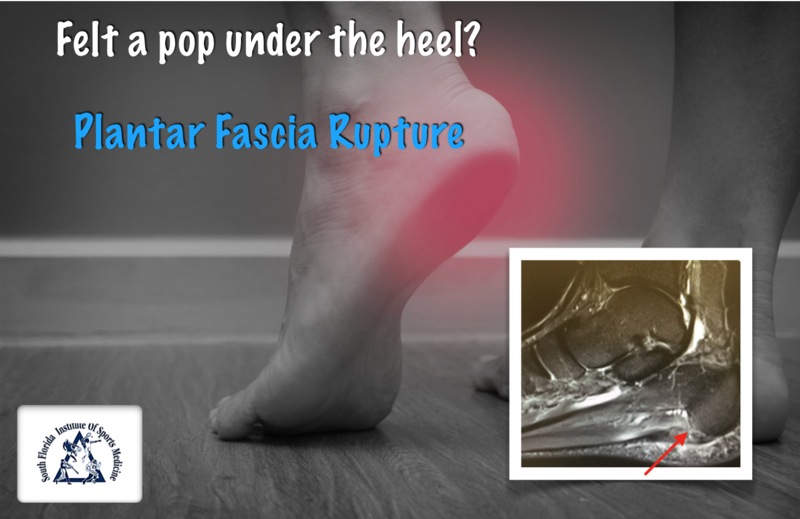 The bands of the plantar fascia are thickened and there is swelling around the soft tissue of where the fascia inserts in the heel as well in the heel bone itself. On this MRI, the white is inflammation.The arrow points to the thickend and inflammed ligament.